Why make a distinction of 'in prison' anyway? What about people serving home detention or community sentences? They have also committed a crime. Having said that the current criteria of disenfranchisement if the sentence being served is longer than three years is also completely arbitrary. And who is going to be politically disadvantaged by losing 5 ot 6 thousand votes? Perhaps the Aoteoroa Legalise Cannabis Party might take a hit:-) But seriously, spending bucketloads of parliamentary time and taxpayer money on this bill is just absurd. I have been getting pilloried at the Frogblog for suggesting that invalid and sickness benefits are, in many cases, de facto unemployment benefits. So it is with interest that I read about the new testing regime being applied in the UK. Anyone claiming incapacity benefits, now called Employment and Support Allowance (ESA), must undergo a thorough medical examination within 13 weeks. The Work Capability Assessment grades them in categories such as walking, sitting, standing, memory and concentration. Those with 15 points or more are classed as "Support Group" and are allowed full benefits. A second classification, the "Work Related Activity Group", means the person does have health issues but will be given work-focused interviews with a personal advisor to help them get a job. The third classification, "Fit for Work", get no incapacity benefits and have to sign on for Jobseeker's allowance. Every benefit claimant will have taken the test by 2013. ...[of] almost 300,000 people who applied for sick benefits, 200,000 failed the test and were told to get a job. ....68 per cent of people trying to go on the sick were fit enough to get a job. They were put on Jobseeker's Allowance and paid a lower rate than the disability benefit of up to £95 a week. Here's a different idea. Canada has also been ahead of the game when it comes to welfare reform. In British Columbia however, time-limits failed due to massive opposition from a variety of quarters. According to this 2008 article however another measure aided a reduction of rolls by 30 percent. The government's target of a 30 per cent reduction in the welfare budget and caseloads was achieved through other methods, particularly the new rule that required two years of financial independence in order to be eligible for welfare, and a new required wait of three weeks before a person could apply for benefits. Requiring two year's prior financial independence would certainly close the door on thousands of young incomers who subsequently can't get off welfare. It is an idea that might be politically feasible here. And if ideas aren't politically feasible, unfortunately, no matter their merits, they are dead in the water. I talked to the Prime Minister today. He was doing his regular question and answer session on NewstalkZB . The host, Justin du Fresne, tackled him about work-testing the DPB and the problem of people adding to their families to get around it. Mr Key said if we can just park that for a moment, went onto a related issue and didn't return to it. So I rang in and asked him not to park it. And while he was busy getting people off the DPB and into work at one end, what was he going to do about the couple of thousand of teenagers going on it every year? I was particularly interested in the last thing he said. That the US time limits were "in states" which gave the advantage of simply being able to pack up and move to another state. That is exactly the objection I used to hear from the Left. If this was the case, that people could move to another state where there wasn't a time limit (wrong), or one could start one's entitlement over (wrong) one would expect to see reduction in some states and growth in others. That wasn't the case. Not in the early days, when the rolls plummeted, and not from Jan 2004 - Jan 2008 when only four states showed slight growth - Maine 12%, Massachusetts 6%, Oregon 8% and South Dakota 2% - and that was probably due to the recession beginning. I was unable to challenge him on it having been disconnected after putting the question. But that's OK. It's a great opportunity anyway. To his credit he acknowledged that some people were having children to either get on or stay on a benefit but, reading between the lines, there is little appetite to change because of the "what will happen to the child?" argument. As I have said before, that is exactly what some beneficiaries bank on. Children are meal tickets and hostages to their own desired lifestyle. Tough? That's what The NZ Herald headline says. TOUGH NEW WELFARE LAWS LOOM THIS YEAR. OK. Let me read this from the viewpoint of a beneficiary. I'm on the DPB but my kids are only aged 2 and 3. So this isn't going to affect me for four years yet. And even then, the change is being phased in over several years. So that might push it out for another 2 or 3. Mr Key was talking about what getting 5 percent of parents with children aged 6 or older would save the country, so obviously their expectations that I am going to go to work aren't that high. And even if they do tell me I have to do something in 2017 say, it's only 15 hours a week. 3 hours a day. I can do some sort of course at home while I ease my way back into the workforce. Anyway, might have another kid by then, in which case none of this matters. I'm a 16 year-old girl who has grown up on welfare but I really want my own space, I really want to get away from my pain in the arse mother. If I got pregnant, like Mum did, it wouldn't really matter. I can still get the DPB (and a place of my own) for six years at least. That's an age. Oh, and I can fast-track it all by getting on the sickness benefit first. I'm on a sickness benefit because I have alcohol-related depression. What does all this mean? I have to jump through some more hoops? Big deal. They've already been making me do that anyway. I've already been signed off by that 'designated doctor' WINZ sent me to. Nobody should be under any illusion that National is getting tough on welfare. They should be red-faced over these window-dressing gestures. Really. It's nothing more than 'been there, done that'. In his statement to parliament Prime Minister John Key today said that New Zealand needs to bring welfare rolls "back under control". "Mr Key's assessment of the situation is correct but his prescription for bringing the rolls back under control is not," said Lindsay Mitchell, welfare commentator. "Work-testing the DPB when the youngest child is six will simply encourage some people to ensure their youngest child is never older than six. In other words they will add children to their benefit. It is already the case that around 5,000 babies are added to existing benefits every year. At the very least a cap on the number of children needs to be applied." "He talked about stricter criteria and testing for those on the sickness and invalid benefits yet mentioned nothing about, for instance, compulsory treatment for drug and alcohol addicts. He said the reforms would 'squarely focus on helping people get back to work as soon as possible'. But Labour had already implemented extensive reforms aimed at achieving exactly this and made no impression on the numbers, which continue to grow. Last year, under the new National government, the number on the sickness benefit grew by 16 percent, the biggest growth in any year ever." "But the main problem with Mr Key's prescription is that beneficiaries, and potential beneficiaries, have heard it all before. Welfare is business as usual. Any government serious about reducing dependence would be spelling out time limits, and strict conditions of receipt which would manifestly change expectations. He has missed the opportunity again." Key is tipped to announce welfare reform plans in his speech today. This will no doubt involve a reiteration of their 2008 campaign promises. While manifesto promises are not implemented there remains an opportunity to keep rolling them out as 'new' announcements. "Within twelve months of a new National Government, every person who has been on the UB for more than a year will be required to re-apply for their benefit and undergo a comprehensive work assessment." That was re-announced just before Xmas and it wouldn't surprise to see it re-re-announced today. An earlier post covered each manifesto promise and the failure thus far to implement even one of them. Still, putting aside rational judgement, I am ever the optimist. But a reader over my shoulder has just walked away saying the prospect of those Tories doing anything isn't great. In fact, he has just returned to tell me that John Key is not a powerhouse of ideas; he is not an ardent reformer or we would have heard about him long before now; he isn't a Mike Moore or a Roger Douglas; or even a Helen Clark. It is unfortunate that the current Reserve Bank Governor is a naysayer while the ex is the ambitious one. Bollard may be praised for speaking his mind but should also now have a question mark over his suitability. I'm not fatalistic about New Zealand being unable to close the gap. But based on the evidence so far this Government is taking us in the opposite direction." New Zealand incomes were about one-third lower than those in Australia and unemployment was higher after years of being lower. By the HLFS calculation, yes Australian unemployment is lower. But based on benefit dependency it is not. These figures are Sept 2009. Let's compare (as best we can). That's not straightforward because Australia uses a working age population definition of 15-64. Our statistics are 18-64. Australia includes people on a benefit under 18. Our quarterly statistics do not. So maybe if I just multiply our data by a population factor of 5.08 that will allow a rough comparison. 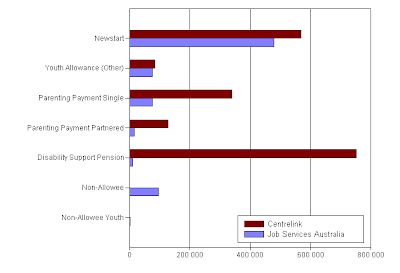 Sept 2009 - Around 560,000 people were claiming the unemployment benefit (Newstart) in Australia compared to 61,000 in NZ. Australia proportionately much higher. Around 750,000 people in Australia were claiming a disability pension while in NZ 141,000 people were on a sickness or invalid benefit. Australia slightly higher. 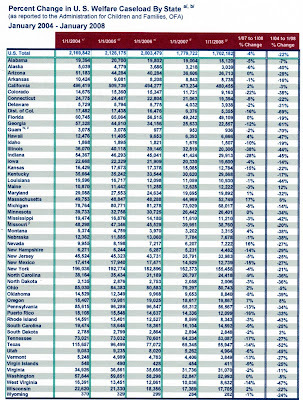 Looks like another 220,000 are on other benefits bringing the total to 1.870 million compared to a total in NZ of around 332,000 (incl 16-17 year-olds). NZ's dependency rate is lower, or around 90 percent of Australian total. So there we go. Benefit dependency is a huge cost on government and the economy and Australia needs to catch up with New Zealand's lower rate.